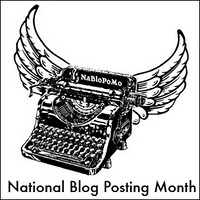 For anyone who doesn't know, throughout the blogging community, November is National Blog Posting Month (NaBloPoMo). This means, that for the entire month of November we challenge ourselves to blog every single day for 30 days. This year we at Gluten Free Edmonton will be doing it again. Call us crazy, call us masochists, call us uber over achievers...either way this is our challenge and we accept the challenge once again. Last year was our first time participating in this event and we were successful so here's to NaBloPoMo 2011. So we welcome you to join us daily throughout the month of November during NaBloPoMo. We welcome your input, your suggestions, your comments and as always your guest posts (hint hint). Have a great Novemeber everyone and enjoy Gluten Free Edmonton and everything we've experienced.